Okay, I know that I said that I’d be taking the day off, given that the Chamber would be moving into our new offices. But, hey, we hired union guys to do union work, so why should I get casual when they’ll only smirk at me for trying to lug stuff across the room. Plus, I had a couple of work-ish appointments today, so I at least got got-up in a casual biz get-up. As you may recall, this summer I was the guest of the Mather Place of Wilmette, a retirement community. I moderated their Gentlemen’s Breakfast, and discussed my tie blog. I took pictures. I ate breakfast. They gave me cookies and a tie. I ate the cookies and have saved the tie until today. As you can see, it is solid orange. The Mather’s primary color is orange. With the textured fabric, it really takes on extra life, unlike that spate of boring prose. Egads, this is the 2nd time this week that I’ve had to recreate my tie-shirt combination. The other day I even had to do it a day later! 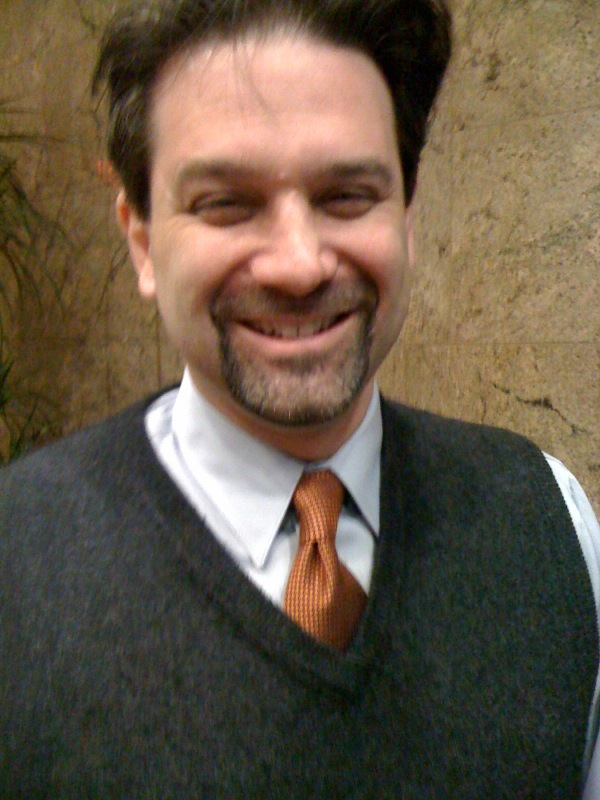 You’d think that after 152 post-tie-tying mini-photo sessions that I’d have it down pat. Uh, no, you would think again. Anyway the Tie du Jour is from The Tie Bar, and it is most certainly worn in celebration of Halloweekend. As I mention my emceeing the Gent’s Breckie, it reminds me of another opportunity for me to utilize my H-List celebrity status, and it tied in (get it…tied?) nicely with today’s event. The 500 Davis building hosts a pumpkin-carving contest for its tenants; for the 2nd year in a row, I was a Celebrity (H-List, but hey, whatchagonnado?) Judge. I managed to get a new GWT at the contest. Richard Similio, who manages the property, is my friend who invited me to partake in the bribery…I mean, detailed & honorable judging of the entrants. As luck would have it, we now have a new member of the other GWT club…Girls With Ties! 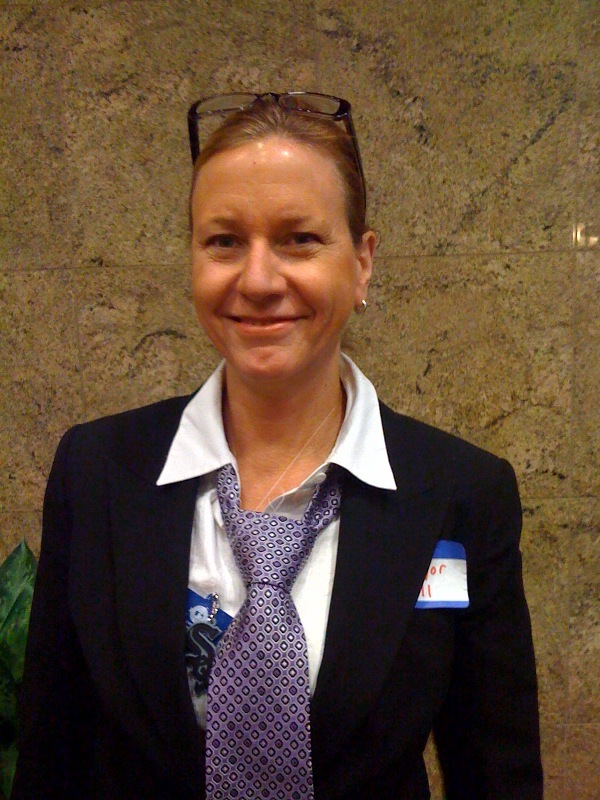 Marsha Hagney, who is the Government Relations Manager at the American Massage Therapy Association, sported this awesome purple tie (from Bruno Piatelli) as part of her mayoral costume. There was a good story behind her acquiring the tie, but perhaps we should leave that for her to tell (in a comment). This is why I love my chamber members, my readers and my chamber members who are readers. 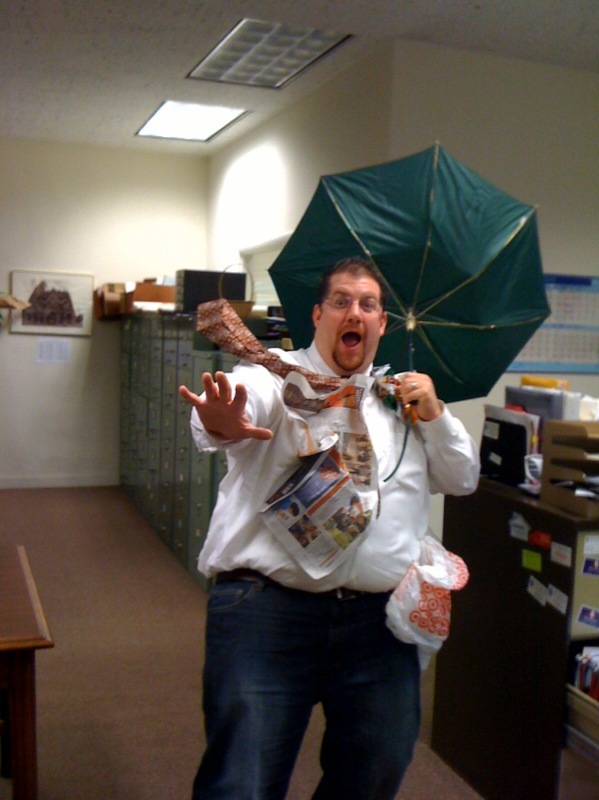 Jeff Semler, who works at Heil, Heil, Smart & Golee here in Evanston, sent me this pic of his Halloween costume. Given our recent “Storm of the Century”…which may not actually be the storm of the year, to tell you the truth…Jeff created a new category: WGWT (Windy Guy With Tie). Very creative…notice the tie. 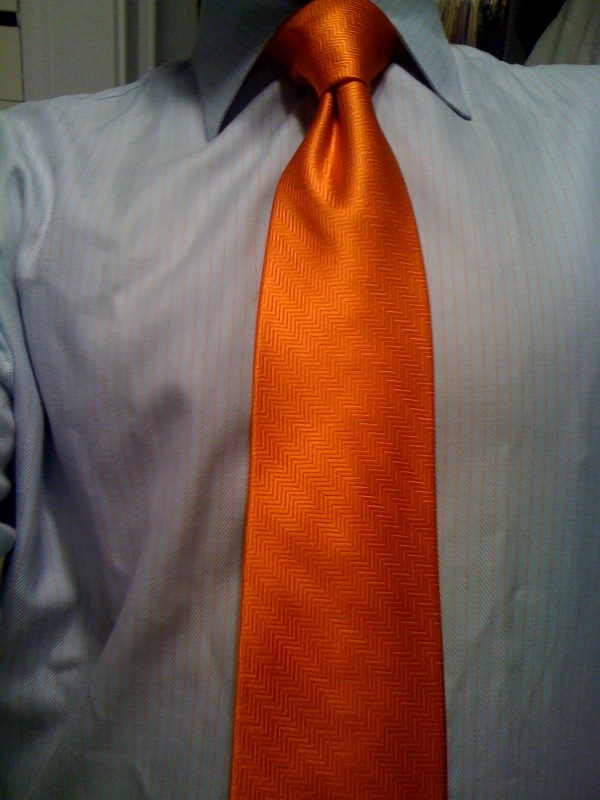 This entry was posted on October 29, 2010 at 9:38 pm and is filed under Girls With Ties, Guys With Ties, Tie du Jour. You can follow any responses to this entry through the RSS 2.0 feed. You can leave a response, or trackback from your own site. Love it!! Especially Windy guy!! I’m dying to know where the shirt is from too.